This morning at Raccoon Creek State Park set the table for me, so to speak. The huge Doak Meadow (100 acres +/-) was green and lush, with frenetic male Great Spangled Fritillaries flying non-stop in their desperate search for females. I did see two females, but they stayed low to the ground, flying under the upper stratum of meadow grasses, perennials and shrubs. There was a near total absence of Bergamot (had a big display in 2014), common milkweed plants were in the minority, even dogbane was not as numerous as years gone by. Joe Pye Weed was present here and there along the forest that edged the meadow, but here another puzzling minimal showing. Goldenrod was coming along, but it too appeared to be reduced in concentration. The big find of the morning were a handful of Northern Pearly Eyes, looking fine, and probably pleased with the rains that we had a few days ago. One Northern, with what seemed like a smile, offered a swell pose, if, if I set my foot into a small puddle. I did, and my boot sank 4″ into mud! Absent were Wood Nymphs, and the Little Wood Satyrs were all (?) worn and very pale in color. One Little Wood Satyr gave me a full, unhurried photo opp of its dorsal surface, but it was quite worn, with heavy scale loss. Before I called it a morning, I found this clump of Butterfly Weed (Asclepias tuberosa). It’s the same group of plants that this image shows. They were a day or two away from opening. The Coral Hairstreak butterfly you see here is usually difficult to find, and these blooms are their very favorite. You know I’m thinking, wouldn’t it be wonderful if I could cop an image of Coral and Butterfly Weed that surpasses this one? That means returning those 37.2 miles in 2 days, on Friday, June 24th. No guarantees, and if I can return to this spot, it might also mean bringing my tiny folding seat, and waiting patiently for the Corals to show up, if 2016 is a year when they do. There are no guarantees, only perseverance, tenacity, enthusiasm and . . . a dab of Luck. Chomping on a Moth . . .
September 4th 2014, and I’m working the edge of a 100+ acre field in Raccoon Creek State Park, southwestern Pennsylvania. For those of you from the more than 100 countries who visit wingedbeauty, this is about 8.5 hours by car, west of New York City. August and September bring new action to the northeastern United States, and our female Praying Mantis (Mantis religious) is common during these months. I met her as she was in the middle of devouring this moth. She did not appear to be threatened by my steady approach, macro- lens come within some 2 feet of her. That was no surprise, because Jeff remembers back when he was a boy, and reached out to grab a Praying Mantis. OMG! Her bite HURT! She also speared me with those skin piercing points on her forelimbs. She’s got the weapons sure enough. I shot out several dozen images, what with her so fine to look at, the pathos/natural cycle of the field, rich-yellow goldenrod flower heads, and excellent early morning sunlight, coming in at a very, good angle. Read a recent discussion on Facebook considering whether or not Mantids are a threat to butterflies. The consensus of some very field savvy folks was that they are not. Our experts infrequently see them take butterflies. I am comfortable with that. Truth of it? I like and admire Mantis religiousa. 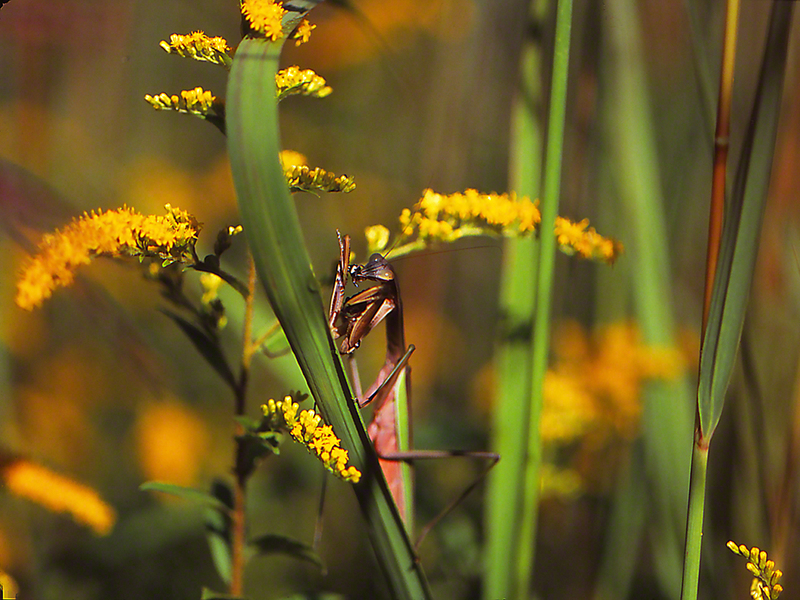 Over time I’ve also come to be an admirer of their formidable cousin, the Chinese Mantid, also found in much of the U.S.. N.B., I’m 2 days back from my 3 weeks out of the country. My field work was very pleasing. When the slides come back from Kansas, we’ll see what we can see. It is a fine September for viewing the beauty of the natural world. Butterflies are flying, topped by Monarchs reappearing in Doak field. In this Southwestern Pennsylvania field, wildflowers are everywhere. 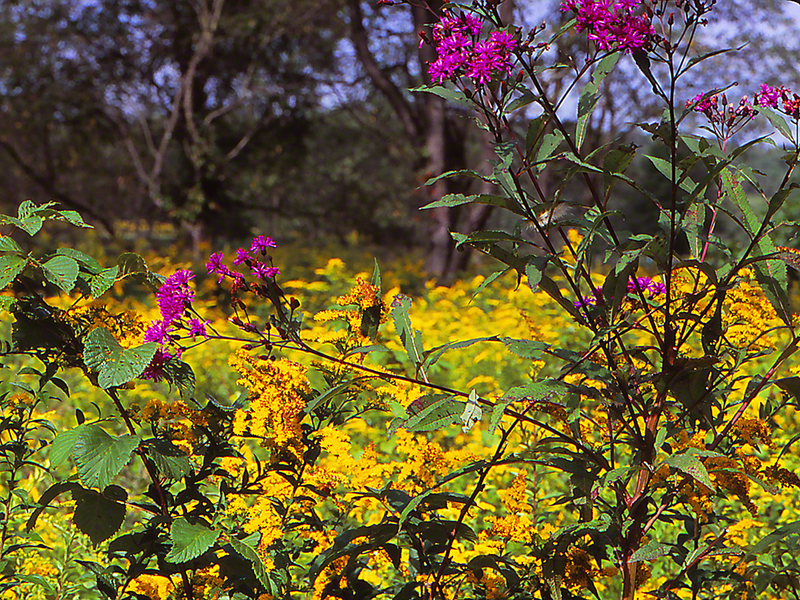 The 100 acres are awash with several species of Goldenrod blooms. The Goldenrod, Bergamot and Joe Pye weed are sirens on the rocks, beckoning hungry butterflies, causing them to take breaks from their romantic pursuits and take nectar. That is to say, you’ll need sugar to continue searching for mating opportunities. Folks wonder, why do you go to the same field so often? What can possibly be new there for you? New? I often encounter new butterflies, new situations, new plants and new wildflowers. New insects, new things. New is almost a constant in an undeveloped habitat. 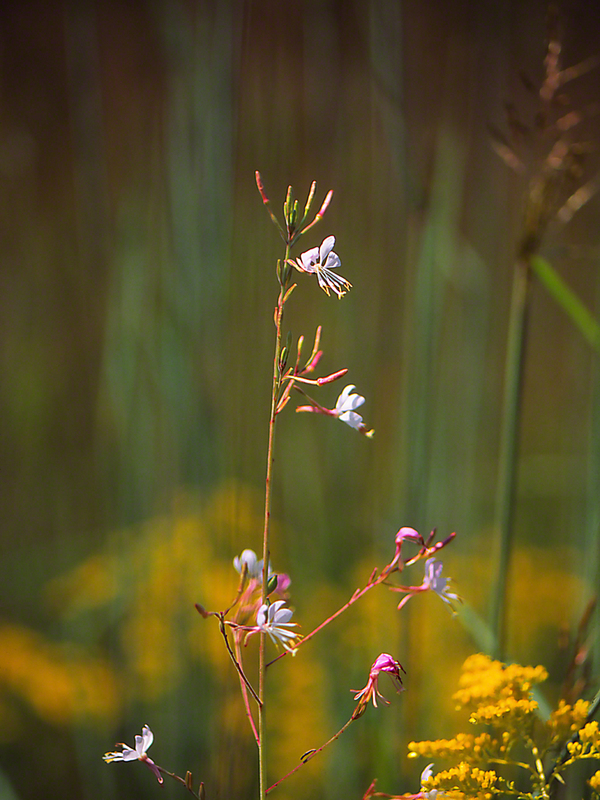 It was September 5th and my scan of the field zoomed in on these wildflowers. Do I know you? Have I seen these before? I didn’t and don’t think so. New! I’m going to go to my wildflower field guides, and attempt to identify this dainty bloomer. If I can’t conclusively do that, then I’ll contact Shane Miller at Raccoon Creek State Park’s Wildflower Reserve. He is the ultimate resource for identifying botany. Pete came back with our ID, Gaura biennis, Biennial beebalm. We just keep on learning, No? New is good. New is stimulating. New is Fun! August 2014, we all remember, made us all anxious. Internationally, things were bizarre. 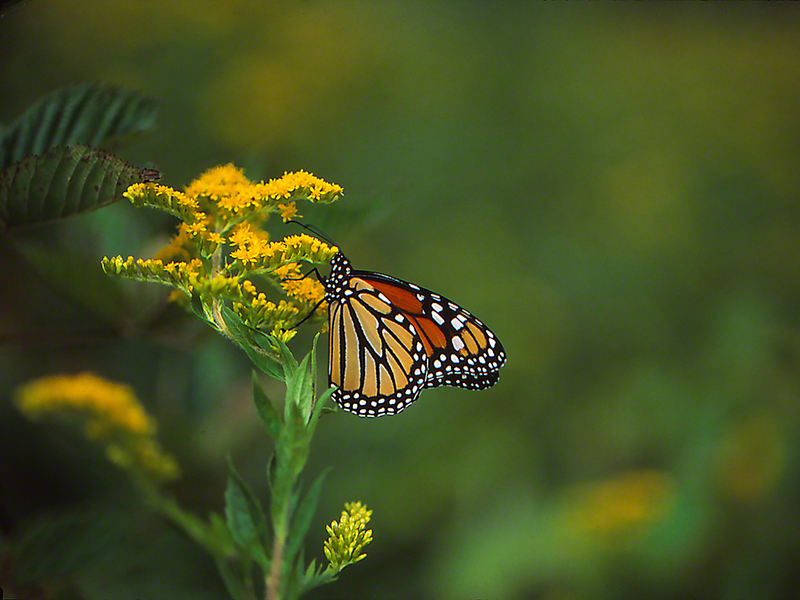 Here in the U.S., almost no Monarchs were seen. The fear of losing these magnificent winged beauties was saddening. Young kids have their cell phones, Xboxes, and all those other devices that monopolize their attention. Those privileged to not be so addicted, have the blue sky, flower blooms and Monarch butterflies. Monarchs that have seen Mexico and New Orleans, at least. With ice covering almost everything this morning, we share this exhilarating images of the rest of the story. September 5th, and our heroine breakfasted that morning on the nectar of goldenrod blooms, millions of them from which to choose. We’re in Doak field, Raccoon Creek State Park in southwestern Pennsylvania. An 8 hour drive west from New York, New York. She is truly a winged beauty. Her colors and hues fresh, and a winter antidote, for your eyes to savor. Agree? The reports from Mexico are encouraging. Improved numbers, besting the dismal counts of 2014. Jeff is ecstatic. There will be Monarch butterflies to anticipate in Pennsylvania, Georgia, Kansas and Maine this year, G-d willing.